Discover our different mesenchymal stem cell workflows and find the one that fits your experimental needs. Human umbilical cord tissue can be dissociated into a single-cell suspension by combining mechanical dissociation with enzymatic degradation of the extracellular adhesion proteins that maintain the tissue's structural integrity. Our Umbilical Cord Dissociation Kit, human and the gentleMACS Dissociators are the perfect combination for standardized and reliable dissociation of umbilical cord tissue. Get your research off to the right start. Rely on excellent sample preparation with the gentleMACS Dissociator family. Start your experiments off smart with standardized and reproducible tissue dissociation. Our cell culture options provide reliable solutions for the maintenance and expansion of MSCs with preserved differentiation potential and immunomodulation ability. 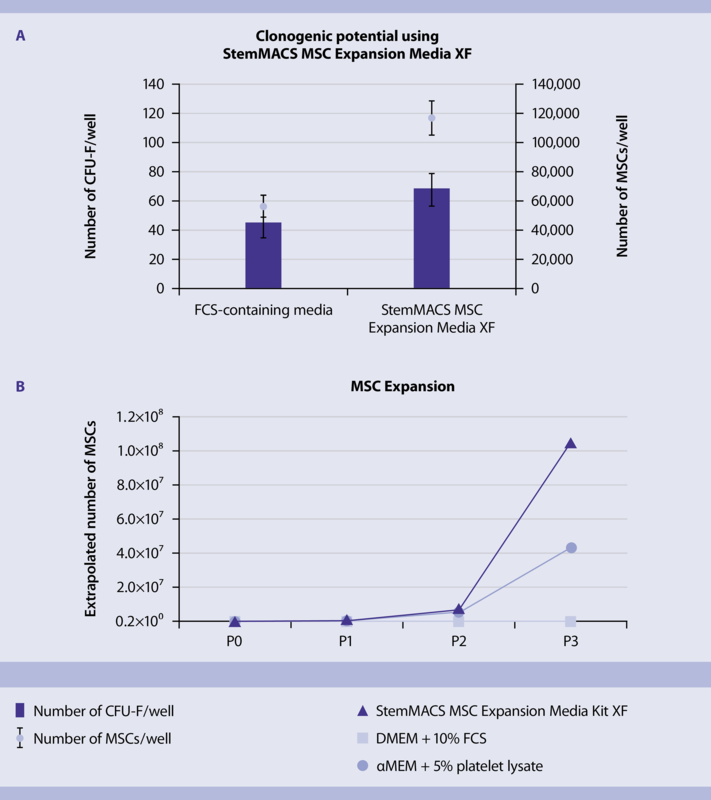 MSCs cultured in StemMACS MSC Expansion Media XF show an increased expansion rate compared to other standard MSC culture methods. MSCs cultured in StemMACS MSC Expansion Media XF showed an increased clonogenic potential (A) as well as cell proliferation rate (B) compared to MSCs cultured in αMEM + 5% platelet lysate or when cultured in 10% fetal calf serum (FCS)–containing media. 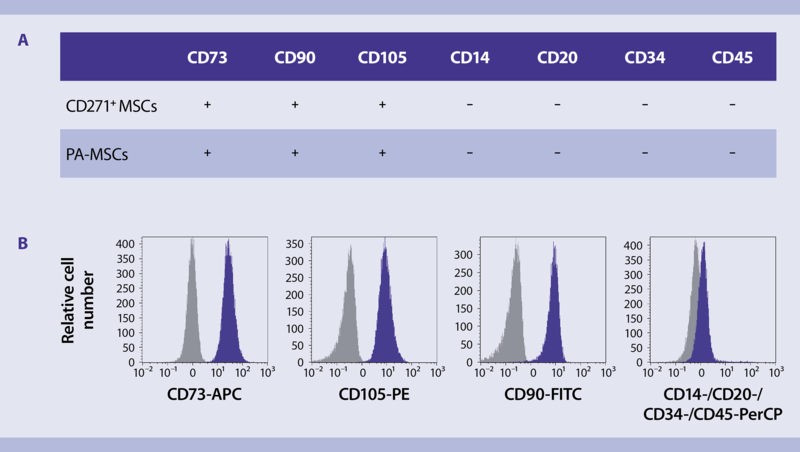 The MSC Phenotyping Kit was developed for the standardized identification and phenotyping of cultured human MSCs by flow cytometry based on the defined ISCT standards. Cells were stained using the MSC Phenotyping Kit, human and analyzed by flow cytometry. 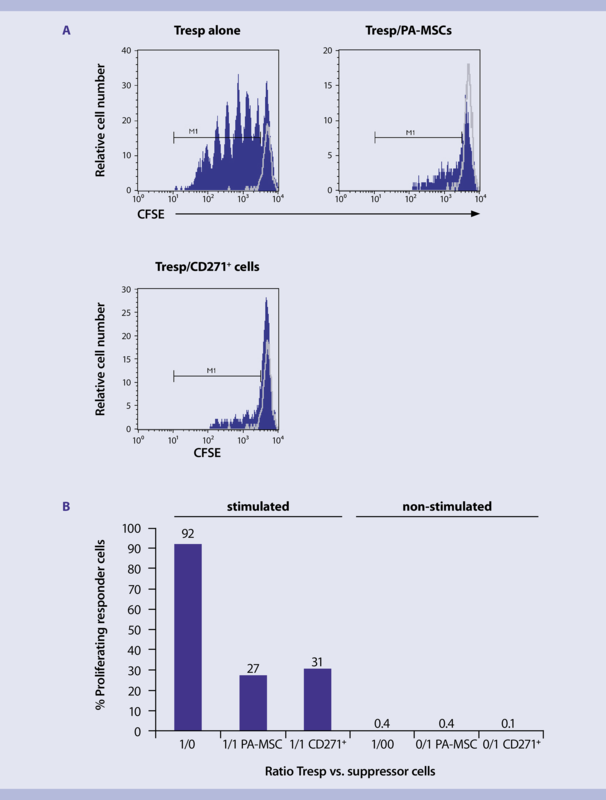 The figure shows the analysis of CD271+ MSCs. Purple peaks indicate staining with respective marker antibodies, whereas isotype controls are indicated as gray peaks. We provide a variety of media options that support the differentiation of MSCs into adipocytes, osteoblasts, and chondrocytes. The different StemMACS Differentiation Media are suitable for the analysis or quality control of the differentiation capacity of expanded MSCs, as well as in vitro studies focusing on the processes involved in MSC differentiation, including gene expression and protein profiling. Adipocytes stained with Oil Red O after cultivation of MSCs for 21 days in StemMACS AdipoDiff Medium. Osteoblasts differentiated from human MSCs after cultivation for ten days in StemMACS OsteoDiff Medium stained with NBT substrate. Chondrocytes stained for aggrecan (red) and nuclei (blue) after cultivation of MSCs for 21 days in StemMACS ChondroDiff Medium. Tresp cells labeled with CFSE were cocultured with either CD271+ cells or with PA-MSCs. Cells were stimulated using the MSC Suppression Inspector, human or left untreated. (A) Tresp cell proliferation was flow cytometrically measured as CFSE dilution (indicated by M1). (B) Data represent the percentage of proliferating Tresp cells cultured in the presence of PA-MSCs or CD271+ cells with respect to responder cells cultured alone. 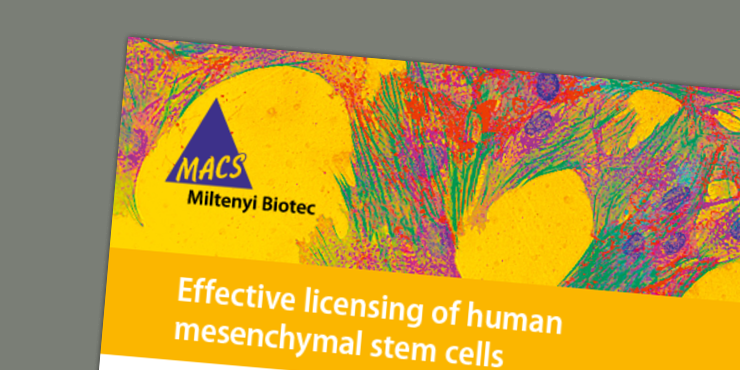 This application note describes the licensing of MSCs using IFN-γ and TNF-α and a procedure to analyze marker expression and the immunosuppressive characteristics of MSCs using the MSC Suppression Inspector, human.